Why "Meteor Farm?" They have to grow them someplace. What's "Meteor Farm?" A Spatial Concert of Ceremonies featuring nearly 200 performers from the World Music Program at Wesleyan University, Connecticut. That means you are likely to hear a South Indian Trio play for a moment, railroaded by a West African Drum Ensemble, infused with an Indonesian Gamelan, and stomped on by a big band and a choir singing the cosmic words of Carl Sagan. It's a trip. It's the good part of globalization: simultaneities without loss of identity. Who else but Henry Brant could mastermind this universe? Apart from his trusty sidekick Neely Bruce, of course, aided on this occasion by Richard Winslow filling out the three conductors' podiums. Like the whole world of music but can't decide which is the best? Try Meteor Farm. It's what God has on His iPod. 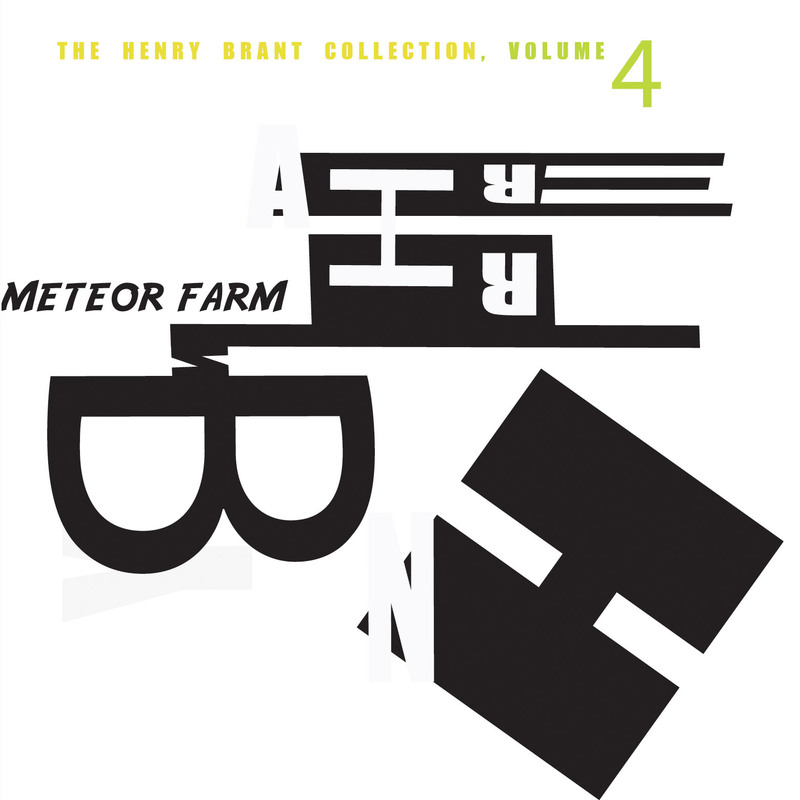 Meteor Farm: A Spatial Concert of Ceremonies constitutes the fourth volume in Innova's The Henry Brant Collection. As with several other Brant works, this 1982 work comprises the whole disc. Composed to a commission from Wesleyan University in Middletown, Connecticut, this piece is scored for every ensemble and soloist available on their campus in 1982. Three conductors lead two sopranos, two choruses, each retrofitted with their own complement of saxophones or flutes, orchestra, a section of "Wall Brass," two groups of percussion, steel drums, jazz band, Javanese Gamelan, West African drummers and a South Indian Classical Trio - did we leave anything out? As one can imagine from such a massed ensemble, the sound of the piece is gargantuan and gigantic. Though not all of these groups necessarily play at once the whole time; naturally the music is spread around the various forces and all manner of combinations are used; the South Indian Trio, supplemented by one percussion group and part of the orchestra, go slam bang into the jazz band in the opening minutes. The choruses wail and scream, alternating with their high flutes and saxes sounding like amplifier feedback, the West African percussion trundles away, great yawps of sound leap forward from the brass. Amid this, there are moments of repose; eerie, spacey sounding music from the orchestra and achingly beautiful passages where the gamelan coalesces with choruses singing in unison. Throughout there are many, many moments where you hear instrumental combinations that just make your jaw drop - you have never heard that combination of sounds before because only Henry Brant would dare try and combine them outside of an electronic music studio. As to whether this follows a program of some kind of logic is anyone's guess, although the trajectory of events is certainly plotted out, and does, in a way, follow a kind of order, here usefully divided by Innova into 17 reference points in coherence to the divisions in Brant's score. From the instrumentation alone, one might get the sense that Meteor Farm is a sort of composite built from the perspective of a pan-African-Asian-American collision of musical events, the ultimately politically correct "symphony of the universe," but it's not like that at all. It is a "concert of ceremonies," a sort of multi-tiered assemblage of ritual music that is both cathartic and more than a little menacing, rather like the effect of walking into the middle of a Haitian Voudoun ceremony by mistake. Brant refused to explain the title "Meteor Farm" to those interested in divining its meaning; in response, he simply stated, "They have to grow someplace." Brant later unsuccessfully attempted to circulate a graphic of himself falling through space along with a Rototiller; this image is included in the CD booklet. One possible correspondence that comes to mind is with H. P. Lovecraft's 1927 story "The Colour Out of Space," in which a meteor lands on a rural American farm that gradually takes over the minds and bodies of its inhabitants; perhaps Brant himself had that effect on the musicians in Middletown, Connecticut! One must be grateful to Innova for making such ultra-provocative and challenging works of Brant available on disc. Even among Brant's worklist, so crowded with pieces made for unimaginable combinations of instruments and instrumental groups, Meteor Farm is in a class of its own - truly spectacular, but inspiring as much fear as awe. Rather than presenting the idealized vision of the world as blend of international cultures all hand-in-hand, he has created a daring, and honest, vision of it as a noisy, threatening place. Now be prepared: as always with Henry Brant, you are in for something very special, and pretty wild. When he was invited in 1979 by Neely Bruce, composer and professor of composition at Wesleyan University, to compose "a major work for chorus and orchestra", Brant inquired about the resources of the University and its music department. And when he heard what was there, he decided to use them all. And there seems to be a huge amount of music resources at Wesleyan, not just from the Western tradition: add to the Symphony Orchestra, large Jazz Band, Percussion Ensembles, soprano Soloists and Choirs, a Gamelan ensemble, a trio of South Indian music, a West african singing and drumming ensemble. "The composer endeavored in his work to make a musical environment in which the various cultures represented maintain their respective integrities" writes Neely Bruce. So it starts with South Indian music, continues with wild Big-Band Jazz of unleashed energy, then what I believe are Indonesian Gamelans with hauntingly beautiful vocal melismata sung by; I think, two soprano soloists, and maybe inspired by some folk tradition from anywhere in the world, or just out of Brant's imagination. Then you get something like a "gothic" movement sounding like a mixture of Orff and Weill with wild shouts from the chorus and gossamer chime-work, later interrupted by the wild Jazz again. Then brass-dominated contemporary music with crystalline percussion which I would have guessed were West african, if the movement hadn't been immediately followed by the unleashed energy and savage beat of the, this time unmistakably, West African drumming ensemble, abetted by shrieking whistles and wild brass riffs. Then massive percussions (metal-dominated) and piano, with again eerie shouts from sopranos in the distance. And it goes on like that in the course of seventeen movements of various lengths, from 1:22 to 13:20 (the finale). The work was first perfomed at Wesleyan University on March 6, 1982 and that's the recording we get (good sound). Whish I'd been there. Why "Meteor Farm"? Brant writes: "The meteors are chips from great galactic ice blocks of ideas. They come hurtling down from the nebulae where they're grown, and on earth they strike human brains and impel processes to action, providing plenty of material for four spearated choirs, each polyphonically sounding off in a different diretion, each announcing itself raucously in its onw dialect and accent, abetted everywhere by multiple, sequestered brass and percussion groups in frictional collisions, both polyrhythmic and polyharmonic". To which Neely Bruce adds, speaking further of the multiplity of music traditions convened: "Any synthesis beyond pure juxtaposition remains the task of the audience". But why "Meteor FARM"? "They have to grow somewhere", answers the composer. This must be the most genuine, outlandish, imaginative and arousing "World music" ever written.